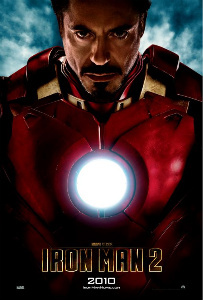 Iron Man 2 is Fun, but… | personal.amy-wong.com - A Blog by Amy Wong. I was really partial to Sam Rockwell’s Justin Hammer, the corporate nemesis of Stark… and well, I’m not a fangirl so I can’t get really too excited having Samuel L. Jackson floating around in every Marvel film playing Nick Fury. Mickey Rourke, however, as much as I could dislike him as a person and how he handles himself as a public figure, did great as villain Ivan Vanko… and was he speaking Russian for real? I don’t know if he was, or if he was any good, but it really gave that little umph to his performance. And Gwyneth, I’ve got a soft spot for her. It still irks me a little bit how much Pepper Potts screams, but I guess that’s how the character works. Gwyneth was really funny with most of her line deliveries, and has a lot of chemistry with Downey Jr., who is his cool funny self here. From all this typing, it seems the film could be really good, but Iron Man 2 suffers from all the funny, as it takes center stage to the actual plot, which seems like afterthoughts additions after each snarky remark. Forget Speed Racer, Watch Iron Man! 2010 Independent Spirit Awards Nominations!